Pugs, Bulldogs, Shih Tzus, and Boxers all have something in common: that familiar, endearing, smooshed-in face. There’s a name for that adorable face: brachycephalic. The above breeds, and many more, are considered brachycephalic breeds and all possess the flat face, pushed-up nose, narrow nostrils, and large eyes. We explain each of these issues in greater depth in separate articles, but below is a general overview of brachycephalic syndrome. Ever notice that Bulldogs do a lot of snorting? That’s probably due to an elongated soft palate. The soft palate is the soft part at the back of the roof of the mouth that separates the nasal passages from the mouth. In brachcephalic breeds, the soft palate often extends into the throat and may partially block the trachea, or windpipe. As bad as those snorts sound, an elongated soft palate actually isn’t usually a big issue and doesn’t generally cause significant respiratory distress. However, lots of barking and panting can cause the tissue to swell, which can lead to breathing problems and respiratory distress. To help correct this problem in excitable dogs that like to bark and pant a lot, the elongated soft palate can be surgically corrected. Stenotic nares is the medical term referring to narrowing of the nostrils. This can limit the airflow, making breathing through the nose difficult. If the nostrils are extremely narrow and cause significant breathing problems, corrective surgery is possible. Laryngeal Saccules are small pouches that are located behind the larynx, or voicebox. Over time, due to the increased respiratory effort, the pouches will turn inside out and stick out into the trachea, further obstructing the airways. These are often surgically corrected at the same time as the elongated soft palate. The trachea, or windpipe, can often be very narrow in brachycephalic breeds, making breathing difficult. Symptoms of brachycephalic syndrome really vary with the severity of the abnormalities, and can range anywhere from noisy breathing, snorting, snoring, and coughing to exercise intolerance and even collapsing or fainting after exertion. Hot and humid weather can cause symptoms to get worse – because of the anatomy of these dogs, they can find it difficult to cool themselves by panting. The increased effort to move air through can cause swelling and inflammation in the airway. This will further obstruct breathing, cause respiratory distress and cause further overheating and a high possibility of heat stroke. In most brachycephalic dogs in normal conditions – not too hot or humid – breathing isn’t difficult enough to cause major problems. But situations that cause extra panting, such as obesity, heat, vigorous exercise, or anxiety and excitement can all trigger the vicious cycle: panting, which causes inflammation of the airway, which increases anxiety, leading to more panting, and so on. It should be noted that brachycephalic dogs are at a higher risk of problems during sedation and anesthesia, as well. If your brachycephalic dog needs surgery or any other procedure requiring sedation, your veterinarian will recommend the best course of action. Some brachycephalic conditions, such as stenotic nares, can be diagnosed through a simple physical. Others, such as the elongated soft palate, usually require general anesthesia. 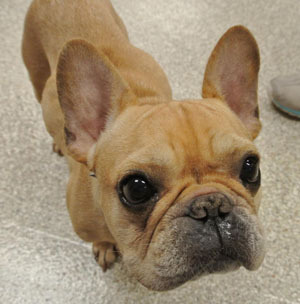 Since most brachycephalic dogs have one or more of these abnormalities, it’s really a matter of determining how severe the problems are and whether treatment is necessary. Screening tests to rule out certain infectious diseases. Treatment can range from short term therapy such as oxygen therapy and steroids to decrease inflammation to more permanent solutions such as surgery. The conditions caused by brachycephalic syndrome are the result of the natural anatomy of flat-faced breeds, so they aren’t preventable. One way of curbing more severe cases of the syndrome is through selective breeding – dogs that need a lot of surgery to correct these problems should not be used for breeding. If your dog suffers from any of the issues caused by brachycephalic syndrome, you can make things easier on him or her by keeping your dog at a healthy weight and avoiding extremely hot weather, especially strenuous exercise, or stressful situations. Because all dogs need exercise, you shouldn’t do away with daily walks. However, try using a harness instead of a traditional collar to make breathing easier. Finally, make sure to have your dog examined by your veterinarian regularly to make sure abnormalities aren’t getting worse and need to be corrected.